For those of us who are forced to homestead in an urban environment, growing our own food can be a challenge. We might prefer a productive plot to one that requires we waste our time and energy on a purely ornamental lawn; a lawn that produces nothing more than a neverending demand for mowers, fertilizers, and herbicides. But our neighbors may take issue with having a “farm” next door. The neat rows of corn and beans and small flock of chickens that we admire doesn’t necessarily appeal to everyone else’s aesthetic. But never fear, there is a compromise: build a landscape that is both aesthetic and productive by using beautiful edible plants. As with any garden plan, the first step is to make a list of the edibles you would like to grow. Take into account what you actually have experience using in the kitchen as well as your climate and growing conditions. That being said, don’t be afraid to experiment. Try looking for varieties with unusual shapes and coloring. Heirlooms are an ideal place to start. Try “Blue Jade” sweet corn, a miniature corn plant that grows only three feet tall. Tuck a few into a bed here and there for vertical interest. Blue-podded shelling peas have vibrant flowers as well as deep, purple-blue pods that can liven up a trellis. The stalks of Pink Flamingo chard are a brilliant pink that is sure to stand out. Italian heirloom borlotti beans, or cranberry beans, have red and cream speckled pods that add definite interest to any bed. There’s a wide variety of edibles out there. Feel free to explore. Once you have your list of desired plants, begin planning your landscape. Consider the height and size of mature plants when determining placement. 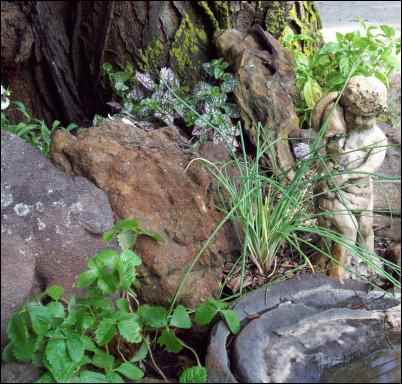 Don’t clump all the tall elements in one area or your landscape will look lopsided. A tree or stand of sunflowers in one corner of the yard can be balanced by an arbor in another. Consider the colors of what you are planting—not just the color of the blossoms, but the leaves and fruit as well. It is usually best to work with only three to four colors in a given area, but if you want a rainbow effect, go for it. Just make sure to repeat the colors throughout the landscape so that it maintains the feeling of a cohesive whole. You’ll also want to take into account the texture and shape of your plants. Do they have big, glossy, flat leaves or delicate, feathery leaves that form airy clouds of foliage? Do they make a low growing mat or a round, shrub shape? As with color and height, strive for balance. The frilly ferns of asparagus in one bed can be echoed by fennel fronds in another. But also strive for contrast. Let the immediately surrounding plants have different shapes and textures so that they highlight each other. Seasonal variety is something to consider as well. Make sure you have a blend of things. When arranging your plants, consider their appearance throughout the growing season. Consider which things will be blooming at the same time, when they will bear fruit and how it will blend into the overall color scheme, and even think of what the plant’s appearance will be in fall and winter. By scattering small clumps of plants throughout the landscape instead of mass-planting individual varieties by themselves in a single area, a plant that is more attractive at one season can help to disguise another whose moment of glory comes earlier or later. Taking all of this into consideration, try sketching out your plan. Experimenting on paper is much easier and far less time-consuming than trying to rearrange plants in the yard. Consider the shape of your house and any already established hardscaping: patios, driveways, walkways. Plan the shape of your garden beds to complement or soften those already established edges. Also, do you want to plant up the entire yard or only decrease the amount of grass you have to mow? If you are leaving any lawn, beds with curves instead of hard corners will make the process of mowing much simpler. When determining the placement of plants in the beds, unless you’re going for a very modern, industrial look, don’t think of planting in rows. This is not your typical vegetable patch. Think of planting in clumps and great, sweeping curves. Scatter multiples of the same plant throughout the landscape: a few in this bed, a few in that bed. And plant thickly, particularly with your single season plants. 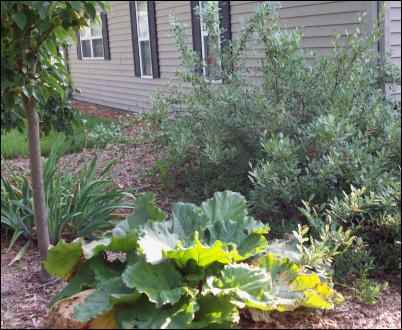 This will help deter weeds as well as give your garden a finished look. Get creative with it. Dwarf varieties of fruit trees can be espaliered against walls and privacy fences or, with a little support, trained into a living fence on their own. Arbors and pergolas can hold any variety of vines, so don’t limit yourself to just grapes or peas. Tomatoes can be trained up over an arbor. Gourds can grow on a pergola. Things such as black raspberries are ideal for vertical growing given their long trailing canes. Furthermore, since black raspberries don’t spread by suckers they are a perfect addition to a densely planted landscape. 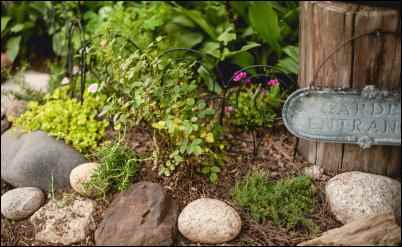 For groundcovers, consider herbs such as thyme or creeping rosemary. Another choice would be alpine strawberries. Unlike hybrid varieties they don’t spread by runner, instead forming neat little clumps, making them ideal for edging beds. They also continue to produce fruit throughout the summer. 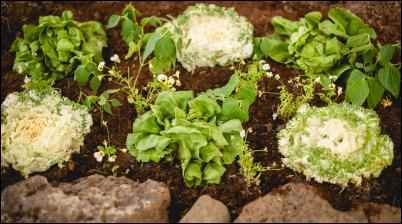 Lettuces and other salad greens can be sown thickly between established plants, reducing weeds as well as providing salad. If you have a property that is already landscaped and you don’t wish to rip everything out and start from scratch, don’t despair. A surprising number of plants that are commonly used in urban spaces can actually provide a food source as well. Once you’ve determined which of the already established plants are useful for your food production goals, you can plan additions to your landscape around them. 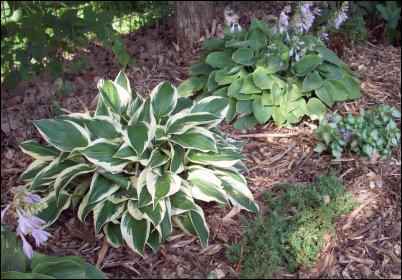 Hostas are the superstars of landscaping. 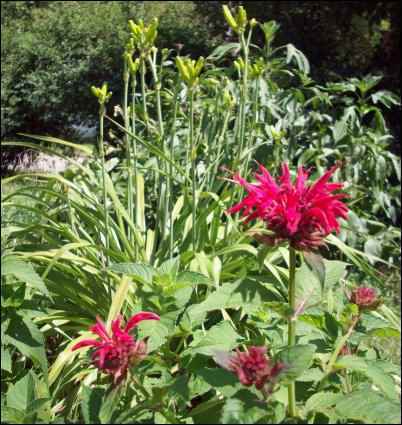 They can be found in almost every shade garden in the country. They light up our otherwise unplantable dark spaces with the variety of their leaf and flower colors. Thankfully they can also brighten our plates. Both the flowers and early shoots are edible. While all hostas can be eaten, the flavor differs from one variety to the next so be sure to taste them to see which you prefer. Roses are another ubiquitous landscape plant. Thankfully all roses produce edible flowers which provide a wonderful addition to salads or desserts. Most varieties also produce hips that not only provide colorful interest to the garden later in the season, they can also be used to make jelly and tea. As an added bonus, rose hips pack in more vitamin C per gram than oranges. If your landscape includes a redbud tree it may seem like a pretty, but useless, ornamental. This, of course, is a fallacy. The flower buds we so admire can be a beautiful addition to your meals as well. Sprinkle them on your salads; use them as a garnish for your desserts; add them to baked goods or stir-fries, wherever your creativity leads you. The seed pods are also considered edible when they are still young and green. However, there seems to be some debate on whether the flavor and texture are worth the effort. But feel free to experiment and come to your own conclusion. Daylilies are another excellent food source. The petals can be eaten fresh or dried or the whole flower can be stuffed. Daylily buds are traditional ingredients in certain Chinese dishes such as hot and sour soup. They can also be eaten raw or in a stir-fry. The shoots of the plant should be harvested when they’re only a few inches long and are delicious when gently sautéed. Finally, the tubers—harvested in fall or early spring—are delicious when roasted. Just be certain that the species in your yard is Hemerocallis fulva as the edible properties of other species are in question. If you have ostrich ferns in your yard be sure to harvest a few fiddleheads in spring. Making sure not to take more than two or three fiddleheads per plant so that the fern has enough fronds left to survive, pick them when they are still tightly furled and boil for about ten minutes. Aronia, or chokeberry, bushes provide not only visual interest to a landscape with blooms and vibrant fall color, but a healthy crop of edible berries as well. They are fairly tart when eaten straight off the bush. However, juicing generally tempers the tartness and they are ideal for making jelly. 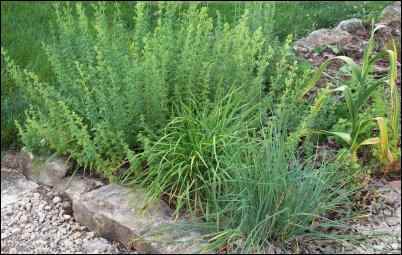 Bishop’s Weed, or goutweed, is a landscape groundcover that can easily take over anywhere it’s planted—so much so that most states have labeled it a noxious weed. Thankfully, if it was planted in your yard by either you or a previous owner it can also be eaten. The leaves are the edible portion. Feel free to eat as much as you want; you’ll barely make a dent in its productivity. The serviceberry is another common landscape shrub and tree—it comes in both forms—often chosen for its early-spring flowers and gorgeous fall coloring. But it deserves to be recognized for its fruit as well. The flavor can vary from one variety to the next so be sure to taste yours first. The berries should be dark blue and sweet when ripe. Surprisingly, the Rose of Sharon is also a member of the edible-landscape family. In this case both the flowers and the leaves are munch-worthy. The leaves should be harvested when young. The flowers, which bloom toward the end of summer, should be picked in the early morning before they’re completely open. Individual petals can be used in salads, or the pistils and stamens can be removed and the blossom can be stuffed with a variety of fillings, sweet or savory. Pyracantha, an evergreen, or semi-evergreen, shrub with wicked thorns, is often used to make hedges or security plantings. Having worked with them on a regular basis as a landscaper, I can attest to their vicious defense system. But before you decide the occasional needle-stab isn’t worth the trouble of having them around, consider their fruit. The bright berries range from yellow to red and make a vibrant show against the dark green foliage. While they tend to be rather tart, a frost will sweeten them up and the abundant fruit will make a superb jelly. If your landscape has an abundance of succulents, you’ll likely find things to nibble on there as well. Aloe Vera is widely considered a superfood Prickly-pear cactus has both edible fruit and pads, though leather gloves are an absolute necessity when harvesting. Even the leaves of most varieties of stonecrop, such as Autumn Joy sedum, are edible. However, these are best harvested in either spring or fall as, in the summer, the leaves tend to be overly bitter. Ornamental fruit trees that put out smaller versions of their namesakes can usually still be harvested. It might take a little more time to fill a basket with ornamental crabapples, but you can still turn them into jelly. The flavor and harvest time of ornamentals may vary somewhat from what you’re used to, however, so you might have to experiment. For instance, Bradford Pears produce tiny fruit that is inedible until after a frost. But once that cold snap hits they are syrup sweet and you’ll have to fight the birds for them. 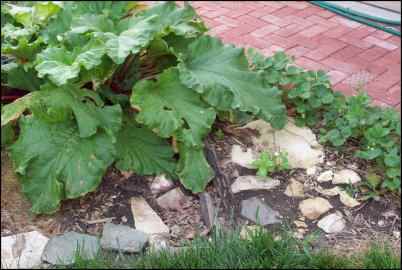 If you are feeling overwhelmed at the idea of transforming your suburban front-yard into an edible paradise, then start small. Don’t worry about creating a dramatic plan; begin with individual replacements. Swap a chrysanthemum with a calendula. Instead of planting a barberry, plant a blueberry. 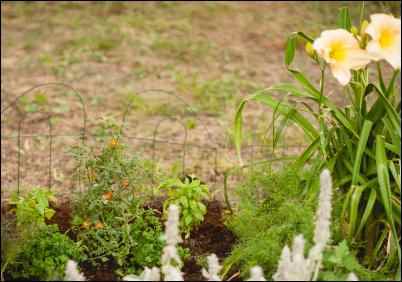 Tuck herbs into your flower bed. Simply take it step by step. Gradually your yard will transform. With a little effort, anyone can create a stunning landscape that is productive as well as beautiful. All it takes is a willingness to think outside the box, something at which most homesteaders excel. Soon, you will have a yard that is the envy of the neighborhood, providing you with beauty, a relaxing haven, and supper. Who knows? You might even inspire your neighbors to trade in their lawnmowers for tomatoes, too.